The Best Landscape Materials Delivered to Your Door! Incorporating over fifty years of experience in the Landscape Materials and Landscape Supplies business, Green Brothers Earth Works are the folks you want count on to supply you with quality landscape materials and supplies for the creation of your one-of-a-kind outdoor living environment. Green Brothers Earth Works offers only the finest quality of landscape materials and landscape supplies. You won’t find a better selection, more knowledgeable sales people or higher quality landscape materials and supplies anywhere in the Atlanta Metro area. When you invest in your home or businesses landscaping, you want only the best products available to not only save you from having to redo your project again and again, but to impress those who enter your property as well. At Green Brothers Earth Works, we offer a variety of top-grade soils, soil mixes, sands, bio mixes, mulch, gravel, stone, and sod landscaping materials for all your landscaping design and implementation needs. Why waste time experimenting with low-grade, low-quality, cheap landscaping materials, when you can purchase the very best at Green Brothers Earth Works. We are experienced, knowledgeable landscape material and landscape supply vendors with a desire to help you create your dream landscaping project at an affordable price. Our helpful, landscaping material and landscaping supply experts are approachable, courteous, and eager to serve you. 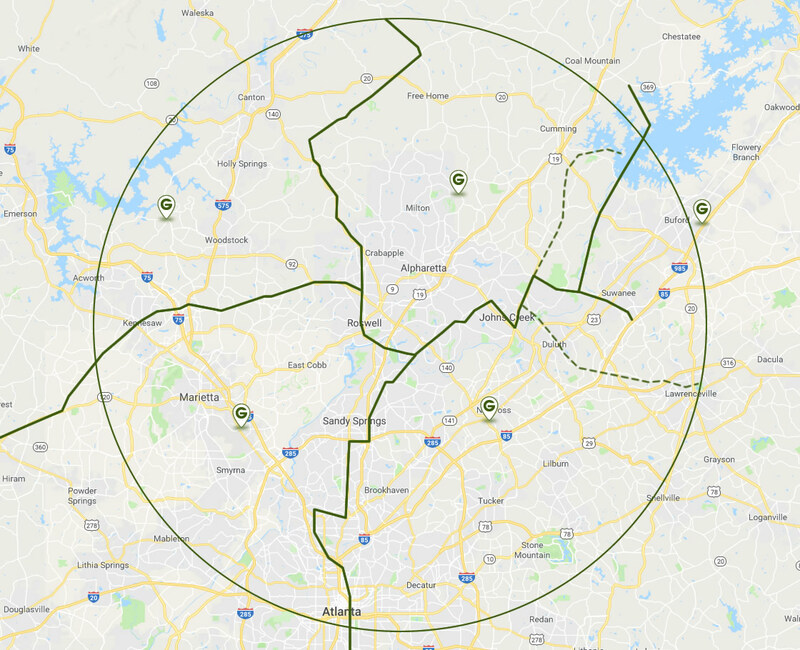 With four locations in the Metro Atlanta area, including sites in Alpharetta, Marietta, Buford and Norcross, you are just minutes away from our help and our resources to assist you in your outdoor living environment creation or makeover. At Green Brothers Earth Works, our goal is to be your first and only stop for all your landscaping materials and landscaping supply needs. We’ll be by your side from design to implementation of your landscaping project. All you have to do is select your product and we’ll get it ready for you and deliver it right to your doorstep. We are ready and eager to help you design a spectacular outdoor living environment for years of outdoor enjoyment. Contact our Atlanta Landscape Materials Company for all your landscaping supply needs. Ordered the 50% topsoil/50% nutria-mulch mx – delivered right on time, and a great quality product. I’ll be sure to order from you again. Thanks. We want to thank you guys so much for being so easy to work with for our “Hands on Atlanta” Day project at Northwestern Middle School. We really appreciate the mulch and the discount on the cypress. The driver was very prompt and I appreciate you working in another load for us on that morning. Thank you again for your continued support of our community schools. You are an asset to our area. Green Bros. is the best place in ATL to buy your landscape supplies. They have the best employees, prices and knowledge to ensure customer satisfaction. They will do everything in their power to make you happy. What makes this company even better is the fact that they have stores in all parts of ATL. Buford, Norcross, Alpharetta and Marietta. Just a note of thanks for the professionalism shown by your driver Brian. The delivery was on time and put in the correct spot. We appreciate it tremendously. Thank you very “mulch” for your donation to our play ground. The mulch keeps the play ground from getting muddy and makes it look nice too! Thank you so much for letting the Milton Sophomore class borrow your flatbed for our Homecoming Parade. Without your help, we would not have been able to participate in this special event. We greatly appreciate your generosity. Thank you so much again!